Make for Bellagio, with this luxury poolside beauty! 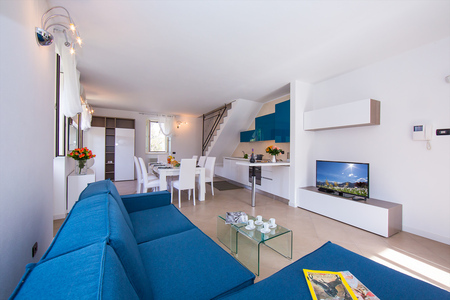 Oozing effortless holiday bliss, this beautiful brand new 2 bed townhouse offers a carefree Central Lake setting. 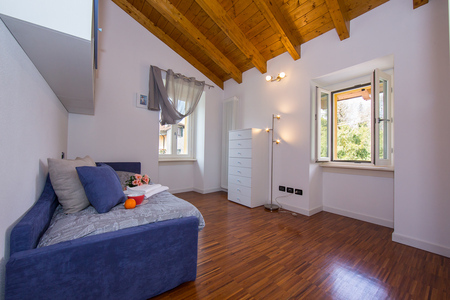 Situated within the peace and tranquillity of a luxury small-scale residence in town, guests can easily strike the right balance of fun and relaxation whilst away. The two storey holiday home provides pure escapism for groups and families of 6, with air-conditioning and cosy central heating on hand for year-round stays. 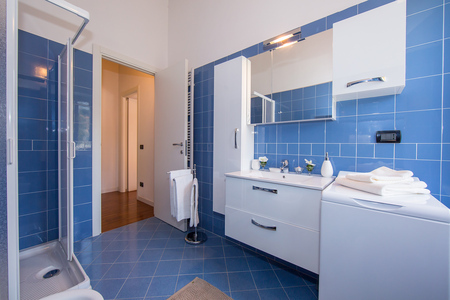 Equipped with all the must-have comforts of home too, including free WIFI, a TV and DVD player, the scene is set for a carefree self-catering experience! With uplifting beamed ceilings, ambient wooden flooring, sleek crisp white and invigorating coastal tones, the interior invites you to relax and play. To the bright and spacious living room, guests can easily sit and socialise within the welcoming appeal of the open plan space. 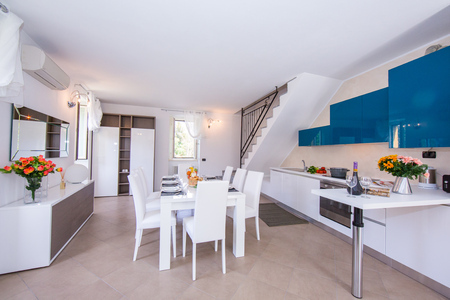 With a stylish sitting area complemented by a striking gloss white kitchen diner for 6, families and friends can easily savour quality holiday moments together. 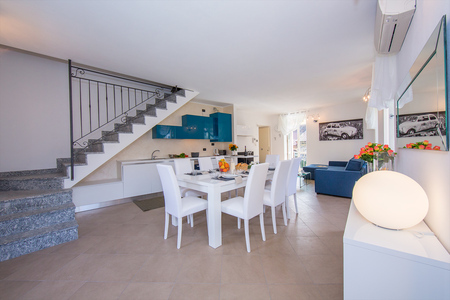 Equipped with a cooker hob, oven, microwave, toaster, kettle, coffee machine and dishwasher, families are perfectly catered for, whilst those looking to entertain in style can make the most of the sunny alfresco dining area, which is easily reached from the open French doors. The captivating coastal style interior effortlessly flows upstairs, where the home’s chic and flexible sleeping accommodation awaits. 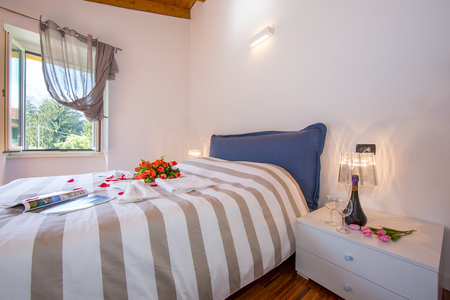 Set within the serenity of the master double bedroom, couples are perfectly able to grab guilt-free holiday slumbers. The uplifting beamed ceiling and sunny private balcony with pool and mountain views only add to the romantically inviting ambience. 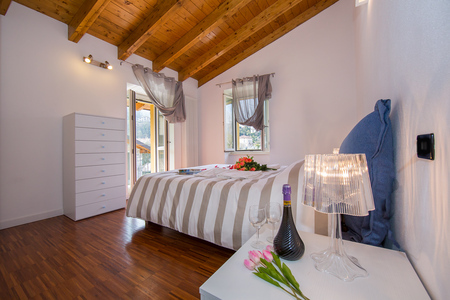 Family members and friends can also enjoy a good night’s rest to the second bedroom. Equally charming and stylish, the flexible bedroom offers a comfortable modern single bed with pull-out single option, for 2. 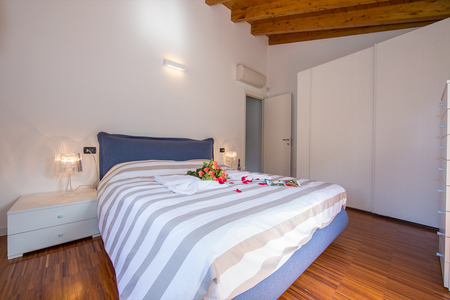 An extra couple or 2 further guests can also be accommodated to the modern double sofa bed, which features to the ground floor living room. 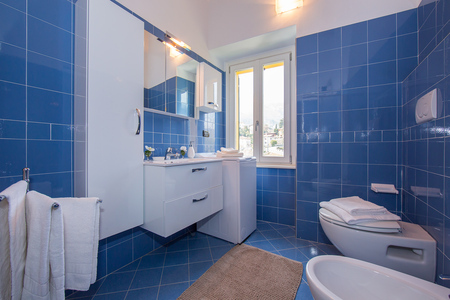 Also decorated in a welcoming coastal blue, the contemporary bathroom sets the scene for an invigorating morning wake up, with a modern shower cubicle featuring alongside a wash basin, WC and bidet. Guests are asked to note that the flight of stairs inside the retreat numbers 12 steps. Situated a few strides from the shared outdoor pool (shared with 6 apartment in total) and home to a sunny oasis with 2 sun loungers, private alfresco dining area, guests can easily while away their holiday here. 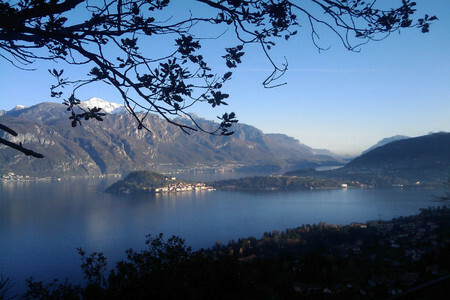 A private parking space and garage complement the facilities of this luxury Bellagio bolthole. 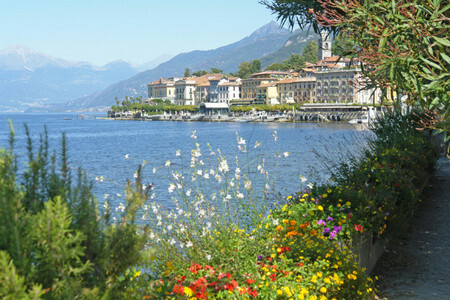 Situated in a tranquil backwater, the new residence is just 200m away from the picturesque Bellagio lakeshore, making it within easy reach of the boutique gift shops, ferry stop and lake view amenities. 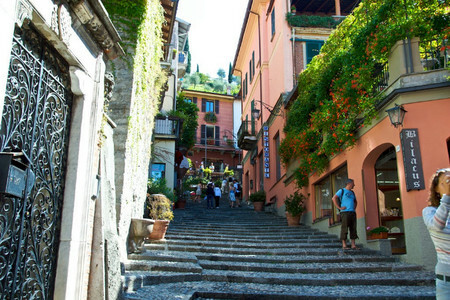 The resort of Bellagio is bursting with timeless beauty and romantic intrigue; with charming townhouses brought to life by billowing geraniums, cobbled shop-lined backstreets and a vibrant cafe-culture to savour along the elegant Victorian arcade. With its fabulous array of authentic restaurants to also enjoy, the scene is set for fine dining and delectable meals out. 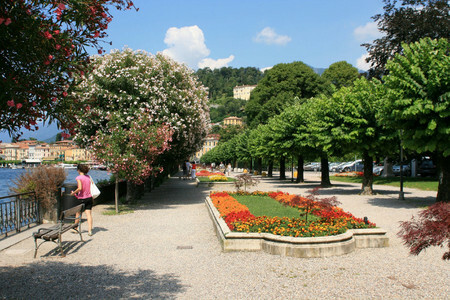 Bellagio also boasts a fascinating selection of tourist hotspots to soak up, including the botanical gardens of Villa Melzi, the spectacular grounds of Villa Serbelloni, the Extreme Outdoor Sport centre and Jungle Raider Park to the surrounding hillside as well as the newly refurbished lakeside Lido. 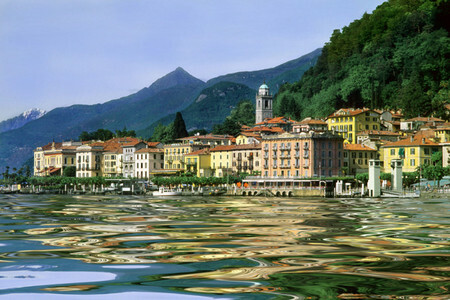 As the sun sets on Bellagio, its beautiful lakeside Lido comes into its own; with cocktails and glamour mixing alongside the well-heeled locals, holidaymakers and Milanese. 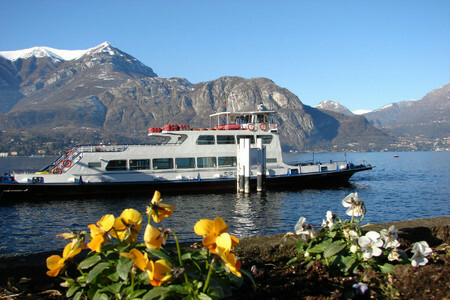 The car and passenger ferry stop also offers a hassle-free way to explore the Central Lake and reach Varenna, Menaggio and Cadenabbia - for sightseeing, fine dining, golf, tennis, hiking, cycling, water sports, spa treatments and shopping. 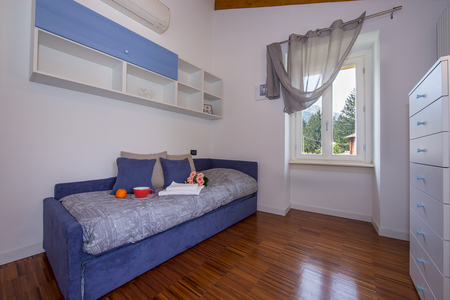 Guests staying in Bellagio are also well placed for enjoying a spot of Italian Alp skiing during the winter-spring months (at nearby Piani di Bobbio and Madesimo). The additional service charge is 215.